The Le Mans round of the MotoGP championship could turn out to be pivotal. A win by Maverick Viñales (Yamaha) and DNFs from both Valentino Rossi (Yamaha) and Marc Marquez (Honda) results in Viñales re-taking the championship lead. Finishing second and third behind Viñales today were rookie, and local fan favorite, Johann Zarco (Yamaha) and Dani Pedrosa (Honda) who came all the way from 13th on the grid. Pedrosa moves to second in the championship behind Viñales. Follow this link to full race results. For additional details and points, visit the official MotoGP site. No sane race lover decries VR46 for crashing in this race! How ignorant. If this race did not rate in your top pantheon of races for emotional highs and lows, quit watching! If you want a textbook race for a reason to watch this sport, you just watched it. Rave and shout for more! Looks like no one was seriously injured. That’s all that matters. Loving me some Zarco, MV, of course VR46, and even Dani. If you haven’t purchased a subscription, do it! You won’t regret it. Like someone below posted: Mugello, VR46’s home track, shall be epic. 2 words “Tyres”, oh wait that’s only 1 word. Continuing to get burned-out on VR46… his post race comments indicate no responsibility for losing the rear. In the accounts I read he completely owned the crash and used the word mistake over and over. No need to make stuff up, just say “I don’t like him”. BW: “…post race comments indicate no responsibility…” Reading comprehension, much? Vinales won the race today, but people lauding the second coming didn’t watch the race. He looked quite ragged and effectively lost it, only to have it handed back to him. He’s going to need that championship points lead, because there’s every chance that MM could now win four consecutive races. I’m not knocking MV, as the pressure at the top is intense and VR knows how to get into people’s heads; something he’ll no doubt do again. Two big mistakes from VR in the last lap of a race was a total shock to my system. There’s (hopefully) alot more to come in this championship. I watched the race. Vinales was passed by Zarco at start but they stayed close until Vinales repassed him. Rossi finally got by Zarco, caught Vinales, passed him, Vinales fought back, pressured Valentino, and Valentino made some mistakes (likely due to having to fight back against Vinales) and Vinales won. At no time did he look any more “ragged” than anyone else. He was the edge as where Zarco, Pedrosa and Rossi. They only one who got in someone elses head was Vinales: He got in Rossi’s head and Rossi choked. We’re all entitled to our viewpoint, absolutely no sarcasm intended. 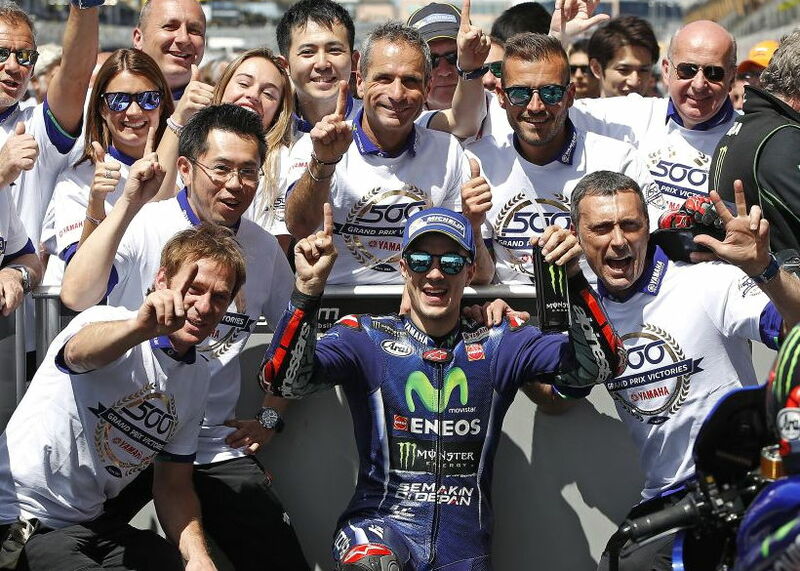 Another way to look at MM’s results this year to date (anything can happen in the future): MM’s extraordinary three MotoGP Championships, including rookie year and breaking the long standing youngest of age record, are just that: extraordinary, with the accent on extra. Maybe, for infinite potential reasons, one of which could be a higher level of consistent competition than MM has ever encountered (in the form of MV), MM’s average performance “regresses toward the mean,” defined here: https://en.wikipedia.org/wiki/Regression_toward_the_mean. Note that “toward” means in the direction of, and does not necessarily mean or imply MM finishes mid pack on average. It means he could be less dominant, less unbeatable, more “human,” never again to repeat and/or approach his earlier record of sequential #1 podiums, and never again win three of four sequential championships. IOW, the days of MM owning the field, the predictions of MM exceeding VR’s nine Championships, or even tying, ignored the mathematical and statistical truth of “regression toward the mean.” It was possibly pure homerism and cheer leading. In this year’s race wherein MM crashed alone in the lead, a major contributing factor may be his intent to create an impenetrable lead over MV, thus causing MV to settle for some position behind MM. Barring MM’s admission, which shall never happen, this hypothesis is unproven and unprovable, as is every other ‘splanation (bow to Ricky Ricardo). On a completely different note…If readers don’t think Honda wishes they signed Johann Zarco instead of Yamaha, I have a gorgeous red bridge for sale connecting San Francisco and Marin County. Pedrosa and Marquez have TQ’s and race wins this year. Zarco doesn’t. They’re also both ahead of him in the standings. Besides technically, he rides for Tech3, not Yamaha. Maybe he’ll be considered for Dani’s seat when/if he retires..
To add about Dani – much is made about VR’s consistency, always right there to capitalize as being part of his greatness etc. Well here VR overcooked his juevos and look who was right there – it’s too soon to tell but I have a weird hunch that DP might just be having a bit of a second wind. He was right there to capitalize – again. For a long time, after Dani caused his then-Honda teammate and recently deceased Nicky Hayden (RIP) to crash (IIRC 2006 when Nicky won the crown), I just could not stand Dani. Over the past few years I have grown to admire and even root for him, certainly over his current teammate MM. Dani has some level of charisma, humility, and likability I find lacking in his teammate. And no, I can’t justify this opinion because of course I never met either man. MM seems to have an “entitled” thing about him. I can’t recall which race, but one race last year Dani just annihilated the field, with possibly the greatest margin of victory I have seen in MotoGP. Riding with Dani via his on-board HR camera, his speed, his riding “in the groove,” was almost supernatural. It just seemed impossible for a two-wheeled vehicle to travel at such velocity. It was a high moment to see Dani practice the art at that level. Mortals shall never understand how these “aliens” are able to ride at such speeds, especially considering the level of danger and risk to life and limb. It is such a shame that Dani was stigmatized by so many, for over a decade, because of a racing incident (that’s what they call them now… back then, it was said he “torpedoed” his team mate) when in actuality, Dani simply lost the front end and was on the ground when his bike slid into Hayden taking him out as well. Don’t take my word for it, it’s still on Youtube you can see for yourself. It was not a purposeful act, and had zero bearing on the outcome of the season. Unfortunate yes, but purposeful, not hardly. Rossi’s loss to Elias by .002 in Portugal, and his crash in Valencia had more bearing on that season. Rossi had come back from a 51 point deficit and was leading the championship by 12 points(? ) going into the final race. Basically all he had to do was stay on 2 wheels and finish no lower than 8th to win the Championship. Instead he crashed and finished 13th. Remember 2006 was Pedrosa’s rookie year. He won his 4th premier class start in China. He won another race his rookie year when he won his 9th premier class start in Great Britain. Up until the 13th race of the season he was in second place in the Championship…in his rookie year. This from a guy reportedly too small to handle the bigger GP machines. For 16 years he has quietly gone about his business racing a Honda motorcycle without show boating, without boasting, quietly, humbly, and every year… every year, winning GP’s , and every year he has been in contention for the crown until something horrible happens to him… and he never complains. Not even when his team mate #93 took him out in Aragon in 2013 and out of contention for the championship. With over 30 premier class wins, over 110 podiums, and over 40 fastest laps, Dani is a great motorcycle racer and a nice human being. He should have legions of fans. # 26, one of the under appreciated good guys, in MotoGP. mickey, you always mention that bit about Rossi leading by twelve points heading into Valencia, and Rossi crashing out in Valencia, and Elias beating Rossi by .002 seconds, as the main reasons Vale lost the title that year, but you never seem to factor in the obvious, which is that Nicky shouldn’t have been down twelve to Vale in the first place. Gloss over it all you want but the Dani Incident happened, you know. That incident had every bit as much bearing on the championship as did Rossi’s crash in Valencia. The difference is, whereas it was in Rossi’s control not to crash in Valencia or to be beaten by Elias earlier in the year, Nicky was totally blameless in losing all those points in Estoril. Long story short, stop placing all the credit for Nicky’s championship on Rossi’s fall in Valencia. Nicky had his share of bad luck too that season, and he managed to overcome it and win the championship in deserving fashion. Oh, and before you throw it out there yet again, the total number of wins per season is only one factor in the overall total, and the points accrued by those wins are known by all before the season starts. Race results do not occur in a vacuum. If wins were worth more points, as you and many others advocate, riders would adjust their strategies accordingly for each race, depending on what the new math dictated. That being the case, no one can say how any race might have turned out if the scoring system and points totals had been different. Marc Marquez’s 2016 season is a perfect example of this. He raced more conservatively and accepted fewer points when he had to, because he could afford to accept fewer points. Had he been trailing in the championship, however, and had the scoring system been different, he may not have had the luxury of accepting those relatively poor finishes. He would have had to go for wins, and he may have fallen more, as he did in 2015. It’s the same story for Nicky and Vale in 2006, or any rivals in any season anywhere…well, with the possible exception of Kevin Schwantz. That guy was going to go for broke every time, no matter what. Truth is every one that wins a Championship and every one that loses a Championship does so thru a variety of circumstances. Wins, losses, crashes, dnfs all contribute to a season and the rider who ends up with the most points is the Champion that year. In 2006 Hayden scored the most points and was Champion. and to the point of my diatribe above, it wasn’t whether Hayden deserved to win, or Rossi deserved to win, whoever win deserves to win …. it was that Dani DIDN’t deserve the vitriolic disrespect and hatred that many GP fans have felt for him for 12 years now. Unless you feel that he did? You flat-out stated that Dani’s error had no bearing on the championship, right before saying that Rossi held a twelve-point lead heading into Valencia. You completely glossed over the glaring fact that the only reason Rossi held that twelve-point advantage is because Dani knocked Nicky out of the previous race. You seem to want to pretend that only Rossi’s lost points matter, conveniently ignoring Nicky’s blameless lost points. Of course Dani didn’t commit a purposeful act. No one in their right mind thinks a rookie Repsol Honda rider would intentionally torpedo HRC’s lead rider in the penultimate round of the series. Nonetheless, he did torpedo Nicky, and that mistake by Dani is the reason Nicky arrived in Valencia trailing Valentino by twelve points. Otherwise, I couldn’t agree more about Dani as a person. Great kid, great rider, class act all the way. I have nothing negative to say about him, other than the obvious: his career stats are inflated beyond all reason by virtue of the simple fact that he’s spent his entire career on a factory Repsol Honda, an enormous advantage enjoyed by no other non-championship-winning rider in the history of the sport. Because of this fact, I place very little credence in the artificially inflated number of pole positions, podiums, and wins he has amassed over his career. Those totals would be wildly different had he been shuttled off to a satellite team as part of the inevitable downward spiral that all other riders in the Premier class were forced to endure after failing to win a championship despite having spent five years on a factory Honda. So, yes, a great person and a great rider, to be sure, but he’s really more of a Randy Mamola or a Max Biaggi than an all-time great in the Premier class. In fact, put them both on the same bike and give them equal support from the same team, and I wouldn’t hesitate to bet on Biaggi to beat Dani over the course of a full season. Heading into Estoril, the penultimate round, Nicky led Rossi by twelve points. During the race, Rossi was leading and Nicky was in a comfortable third position, closing on second place. Nicky was likely to surrender either five or nine points to Valentino. Regardless, he was going to arrive in Valencia with the points lead. Dani made two mistakes in Estoril. The first error was in trying to overtake Nicky at all in that situation, considering Nicky’s place in the championship. Dani should have done his best to hang on Nicky’s rear wheel and provide cover for him, as Colin Edwards attempted to do for Valentino. Instead, for some inexplicable reason, Dani tried to overtake Nicky, at the worst possible spot on the track. The second mistake was he misjudged the corner and hit the curbing while leaned over, as he attempted to stuff it up under Nicky. As soon as he hit the curbing, bam, he went down, then he took out Nicky. At the very end of the race Tony Elias nipped Rossi at the line for the win, so Rossi took twenty points, and an eight-point lead (not twelve points, as you stated above) in the championship heading into Valencia. When Rossi crashed in Valencia, he was already floundering. He was mired in seventh place, stuck behind Casey Stoner, and going nowhere. Nicky was in second place, closing fast on the leader, Troy Bayliss. It sure looked like Nicky was going to be able to overtake Troy if he’d needed to in order to secure the championship. In any case, at the time of Rossi’s crash, Nicky’s second-place position vs Rossi’s seventh-place position meant that Nicky was already back in the points lead, and he looked much stronger than Rossi to that point in the race. Point being, even if Rossi hadn’t crashed in Valenica, there was a very good chance that Nicky was going to overcome Valentino’s eight-point advantage and take the championship. Rossi’s crash meant that all Nicky had to do was keep it upright and bring it home in no worse than seventh place, which he did, dialing it back and cruising home to a safe third-place finish. well Zarco is definitly making his presence known and Vinales is for sure the real deal. Tough breaks for Marquez and Rossi (apparently Rossi wasn’t interested in “settling” for points lol), but races like this make for an interesting season. Glad to see Dani on the podium 3 races in a row (and second in points), but this one was a gift, and he acknowledged as much in his post race interview in front of the camera. Only 5 points difference though between 3rd and 5th where he would have finished if not for Marquez and Rossi crashing out, which still would have put him in front of Rossi in 3rd place in the standings. He undoubtedly got an earful from Crutchlow back in the pits. Check your math again. If Rossi doesn’t crash out, either he increases his lead in the championship or drops to second place in the points. Regardless, he would be ahead of Dani. You’re right VLJ, if Rossi doesn’t crash then he’s ahead. What I meant was with Rossi out, it didn’t matter whether Dani finished 3rd or 5th. Normally I’d think maybe he was just being diplomatic for press, but Cal’s not one to self-censor. Rossi’s only chance to take title is to consistently finish, he can’t hash it out at the front like he used to. Should have settled for 2nd, ended up with nothing because of ego. Vinales and Zarco are the real deal! Zirconia will surely Land a factory Yamaha or Honda ride once his currenthe contract is done, he’said definitely the real deal. Call me crazy, but A) I see things going sour between Honda and Marquez if his current checkers/wreckers ratio doesn’t change soon. B) I could really see Marquez going to KTM if they offer him the proper coin + he’s a motocross and flat track fanatic. KTM is murdering Honda in the dirt currently. C)Zirconia to HRC!? Haha,Freakin auto correct.^Zarco and Zarco, not Zirconia. “Joe Cubic”… no that’s good, let’s go with it. Marquez to KTM will be good. The RC16s are turning out to be pretty good bikes. Can’t recall another race that had me leaping from my seat and shouting with joy like a little kid the way this one did, only to be crushed like never before just a few corners later. This is, without a doubt, the cruelest sport. Man, this one hurts. Oh well. Crazy to see #46 make a last-lap mistake (the first one, when he ran wide) after catching and passing his rivals late in the race (at which point he’s normally money in the bank), but at least he put to rest all the stupid talk that he’s fallen off the pace and is no longer fast enough to contend for wins. He was plenty fast all weekend, and had this race won until that one uncharacteristic mistake. Mugello will be a holy war. Well Rossi still has some good speed but not the necessary concentration in comparison to the younger riders. No one has a race won til the flag is waved. Might as well say that Zarco had the race won til he got passed. No VLJ, Rossi made several mistakes on last two laps and was passed. He’s trying his best but the young guns are tough as nails mentally. As you said Rossi made mistakes on the last lap where he would have been money in the bank in years past. Give the young guys the credit they deserve. Oh, really? And who would these younger riders be, that have so much greater laser-focus concentration than Rossi? Marc Marquez? He’s younger, he’s the reigning champ—a three-time champ, in fact—and he’s already crashed out of races twice this year. Does he not have the “necessary concentration”? Zarco? Five races, one crash, same as Rossi. Zarco even crashed out while leading. Lorenzo? He’s younger than Rossi. He’s crashed this year. So has Dani, and Iannone, and practically everyone on the grid except for Folger. For that matter, how about Vinales? See, last I checked, he too has crashed out of a race this season. Shouldn’t his youthful concentration have prevented any crashes? Racers crash. Every last one of them, regardless of age, experience, talent, focus…you name it, they crash. The sooner you wake up and realize what you’re watching each week and these past few seasons, the better. Quit making these monumentally stupid sweeping statements regarding Rossi. All they reveal is your own ignorance and obvious bias. Or simply quit trolling. Take your pick. VLJ..definite agree…clear and correct..when marquez or vinales crash, it is written off, ignored..but when rossi crashes it is a big mistake, just not right. He still comes from behind, record laps to take the lead, still riding right on the edge for the win, like a champion. Vinales is fastest so this year, Marquez has been fastest before, Lorenzo was fastest before, Stoner was fastest, but the other name that comes up in this long string of championships is rossi whose winning season record is greater and take that away even his not winning seasons would be a record beyond a lot or great riders winning seasons. “Poise and temperament”…I don’t really see it that way. I guess it’s possible, but it seems like he just went the slightest bit too far while pushing hard. These guys have to ride so close to the edge–an edge that sometimes you can’t locate without losing the bike–that there’s no need for anything as big as psychological causes to explain the occasional mishap. Definitely a fun race, though. I can’t imagine Yamaha is terribly disappointed… after all, Zarco is getting to be a pretty big name and is on Yamaha machinery. Valentino Keeps his factory ride because of his uncontested fan favorite status, not because he is a methodical, championship winning machine. As such, nobody at Yamaha is crying about spilt milk. But, if Valentino was a methodical, championship winning machine, he would have coasted home for 2nd place points. I can’t knock the guy at all though. To me it’s unbelievable that A) He can still run the pace of guys half his age B) He’s still so driven to win that he stays in good enough shape to be in the hunt every weekend. Great race up and down the field. Shame VR46 cracked under pressure. But you can’t fault his spirit. He’s just added another million viewing fans to motogp’s popularity. Vinales is the real deal, showing mental fortitude under massive pressure. Everyone who’s beaten VR46 over the past 9 seasons has been put through the wringer by him: CS27, JL99, MM93 and now MV25. Not crowning him but that was a massive psychological examination and he passed the test. DP26 eh ? Seems like getting SG15 as rider coach has worked wonders for his confidence. Always get the feeling he’s a race crash away from another bad injury like the past. If he stays close through the first half of the season, he always gets better in the second half after the summer break. Here’s hoping he stays fit and challenges for the title. Nice touch recognising NH69 by him too. MM93-ALL to do I’m afraid. And it might prove too much but he’s nothing but a fighter. Whither Ducati ? Perhaps that lunch box needs to go back in the nose cone. Got to be a learning year for JL99 because being superb in top end and braking ain’t gonna get it done. Got this feeling about Pedrosa this year. Love to see him win the Championship. 13th on the grid today to 3rd. Good ride. Honda sticking with Dani all this time is proving interesting as well. THE HEAT IS ON – VR may well be increasingly realizing how silly he was to piss that last championship away…. Tires, bikes and quality of the riders just make each year different from the previous and so hard for continued repeat champions as in the past. Without the will to win at the level these guys have, we wouldn’t have the show to watch we do.